Preheat the oven to 350º F. Lightly coat the bottom of a 9x13x2-inch glass or ceramic baking dish with olive oil. In a medium skillet, heat the 2 tablespoons of oil over medium high heat. Add the mushroom stems, fennel, tomatoes, and garlic. Sauté until the vegetables are tender and the fennel is beginning to brown, about 12-15 minutes. Add the white wine and cook until the wine has almost evaporated scraping up any browned bits. Transfer the vegetables to a medium bowl and cool for 10 minutes. Mix in the Fontina, 1/4 cup of the Parmigiano-Reggiano, basil, balsamic vinegar, and crushed red pepper flakes. Season with salt and black pepper to taste. Add the egg and mix until thoroughly combined. In a small bowl, combine the remaining Parmigiano-Reggiano cheese and the panko crumbs, set aside. Fill the cavities of the mushrooms with the mixture, mounding and pressing to adhere. Carefully dip the tops of the mushrooms into the panko mixture, gently rolling to coat the entire top of the filling mixture. Place the mushrooms in the prepared baking dish cavity side up. Drizzle the tops with additional olive oil. Bake until the mushrooms are tender and the tops are golden brown, about 25-30 minutes. Cool slightly before serving. Garnish with fennel fronds if desired. Enjoy! Hiya Nicole! First post for me! Love reading your blog. Stuffed mushrooms are great. It's been a long time since I've prepared. Going to add this w/my for Easter dinner. Not difficult at all. P.S At least it's sunny today. Rain be gone .... yay!! Thank you for dropping a note:) I do appreciate hearing for you! 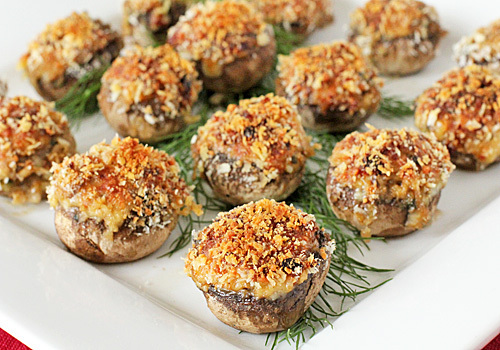 These stuffed mushrooms would be a great addition to an Easter dinner or buffet. Hope you enjoy them. I am glad the rain (we had snow, too-- seriously?!) is gone and the sun is shinning. Best! I've never tried fennel in stuffed mushrooms, but it's a great idea (as is the panko). Stuffed mushrooms are so good, and such a great appetizer to serve when guests visit, that whenever I make a breadcrumb stuffing, I throw a bit in the freezer for spontaneous stuffed shrooms. And nice touch, that dill garnish! I agree, stuffed mushrooms are perfect to serve to quests. Freezing the bread crumb topping is a great idea. They are delicious!Soft and tasty. Perfect for a dinner with the hole family. Just made this tonight... delicious. I had a little fontina leftover, so did a final dusting of fontina over the panko/parm... Never thought of using fennel in stuffed mushroom either, but a nice combo. Well, definitely make this as an appetizer at the next get together. Thanks! I am pleased that you enjoyed them. Thank you for taking the time to let me know.